Dr. Albert Amini is the Medical Director of Arizona Premier Surgery as well as a board-certified General Surgeon with fellowship training in minimally invasive surgery for the liver, pancreas, and bile ducts. After earning his medical degree from Northwestern and completing his surgical internship and residency, Dr. Amini spent an additional year learning about hepatobiliary and pancreatic surgery, along with how to use modern technology to perform effective, minimally invasive surgery. Dr. Amini is board certified by the American College of Surgeons and he is also a member of the Americas Hepato-Pancreato-Biliary Association (AHPBA). In addition to a full schedule of patients at Arizona Premier Surgery, Dr. Amini travels abroad to perform surgeries on underserved patients in the Dominican Republic, which has improved his fluency in Spanish. Dr. Amini has a special interest in gastrointestinal (GI) oncology and complex hernia repairs. At Arizona Premier Surgery, some of the surgeries he performs are hepatobiliary and pancreatic surgery, as well as gastrointestinal oncology colorectal surgery. Dr. Amini has expertise in the da Vinci® robotic surgical system and advanced laparoscopic surgery. Using laparoscopic and robotic techniques, Dr. Amini is able to perform minimally invasive surgery that needs less recovery time than traditional open surgery. In most cases, the pain and discomfort after surgery is much less for patients after laparascopic/robotic surgery. 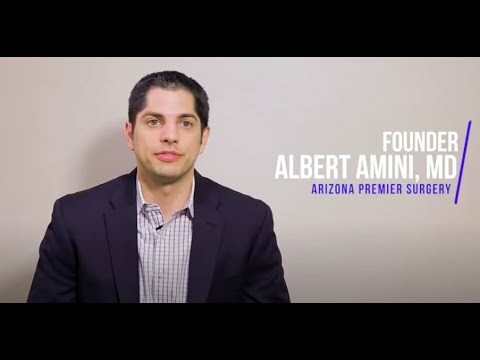 Although he has already spent many years studying and practicing surgery, Dr. Amini continues to look for techniques and technology that can improve treatment for his patients at Arizona Premier Surgery. Dr. Amini earned his undergraduate degree from the University of Chicago and his medical doctorate from Northwestern University Feinberg School of Medicine. He then completed his General Surgery Residency at the University of Arizona in Tucson. During residency, he received the Surgical Intern of the Year Award, the Humanitarian Award, and the Outstanding Chief Resident award. He was also inducted into the Alpha Omega Alpha Honors Medical Society and served as Administrative Chief Resident his final year. Dr. Amini went on to complete a hepatobiliary and pancreatic surgery fellowship at the Medical College of Wisconsin, which specializes in surgical management and ultrasound of the pancreas, liver, and bile ducts. "Emergency department diagnosis of a concealed pleurocutaneous fistula in a 78-year-old man using point-of-care ultrasound." Amini, R., Amini, A., Hollinger, P., Rhodes, S. M., Schmier, C.; World J Emerg Med. 2016 Dec 15. "Palliative Care Training in Surgical Oncology and Hepatobiliary Fellowships: A National Survey of the Fellows." Amini, A., Miura, J. T., Larrieux, G., Tsai, S., Turaga, K. K., Christians, K. K., Brasel, K. J., Clark Gamblin, T., Weissman, D. E., Nattinger, A. B., Johnston, F. M.; Ann. Surg. Oncol. 2014 Nov 09. "Is local resection adequate for T1 stage ampullary cancer?" Amini, A., Miura, J. T., Jayakrishnan, T. T., Johnston, F. M., Tsai, S., Christians, K. K., Gamblin, T. C., Turaga, K. K.; HPB (Oxford). 2014 Nov 15. "Defining the Role of Adjuvant External Beam Radiotherapy on Resected Adenocarcinoma of the Ampulla of Vater." Miura, J. T., Jayakrishnan, T. T., Amini, A., Johnston, F. M., Tsai, S., Erickson, B., Quebbeman, E. J., Christians, K. K., Evans, D. B., Gamblin, T. C., Turaga, K. K.; J. Gastrointest. Surg. 2014 Aug 28. "Surgical management of hepatic hemangiomas: a multi-institutional experience." Miura, J. T., Amini, A., Schmocker, R., Nichols, S., Sukato, D., Winslow, E. R., Spolverato, G., Ejaz, A., Squires, M. H., Kooby, D. A., Maithel, S. K., Li, A., Wu, M. C., Sarmient; HPB (Oxford). 2014 Jun 20. "Palliation: Treating Patients with Inoperable Biliary Tract and Primary Liver Tumors." Amini, A., Gamblin, T. C.; Surg. Oncol. Clin. N. Am. 2014 Feb 25.